For some reason, the recent nightly builds of the Scala plugin now require collection imports to be qualified with "scala.collection". 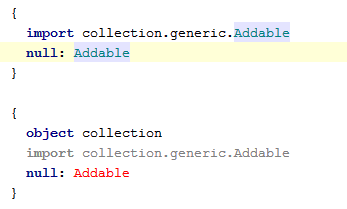 Now Addable shows up as red and the Scala plugin suggests importing "scala.collection.generic.Addable", even through the code compiles just fine. Interestingly enough, other top-level imports, like "reflect.BeanInfo" (which is really scala.reflect.BeanInfo) don't have this annoying tic. Have I misconfigured something with my Scala facet? Does anyone else have this issue? This should take you to the collection package. If not, there is a chance you have a local variable or package in your own project in scope named 'collection', and you should browse to that point. Thanks, retronymster, that was exactly the case. Someone added a com.test.whatever.collection package in a module that this module depends on - although it is strange that Idea should find the import ambiguous, because i am not importing com.test.whatever._ above.